Getting the best reds from Madder sometimes seems more of an art than a science. On a cold wet late April day, I gave a talk on the subject to the Cambridgeshire Guild of Weavers Spinners and Dyers. 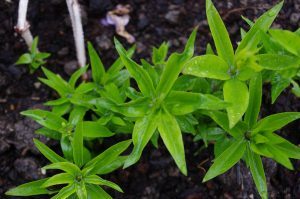 They are a very active guild and judging by how quickly the madder and madder root cuttings disappeared from the sales table afterwards, gardens and allotments across the region will be featuring more madder in the future! Thanks to Camilla for inviting me and for Sue’s lift to and from the station. Also thanks to whoever baked the lemon cake we had with tea afterwards. It was divine. As follow up, here are some pointers for supplies and books I promised to share online. And finally a reminder that as part of London Craft Week I will be helping out at a London Guild of Weavers Spinners and Dyers plant dyeing demonstration at Southwark Cathedral on 9th and 10th May. There are many modern books on plant dyeing which are approachable for beginners. Kristine Vejar (2015) The Modern Natural Dyer, a comprehensive guide to dyeing silk, wool, linen and cotton at home published by Stewart, Tabori & Chang. Debbie Bamford, a pre-eminent historical dyer who sells plant dyed cloth, yarn and threads at re-enactor markets and also via etsy shop. She trades as Mulberry Dyer and is active on social media. Jenny Dean Doyenne of Natural dyeing in UK. Her landmark book is Wild Colour (2010) but all her books are excellent. Robert Chenciner’s book ‘Madder Red, A History of Luxury and Trade’ (2000), Curzon Press well worth getting from a library if you can’t find an affordable copy for yourself. Jim Liles’s book ‘The Art and Craft of Natural Dyeing, Traditional Recipes for Modern Use’ (1990) University of Tennessee Press. Comprehensive recipes and valuable tips for improving mordanting with aluminium acetate. Contains the long method for extracting all the goodness from madder root (p106). George Weil/Fibrecraft for plant dyes and mordants; especially aluminium acetate mordant for silk and vegetable fibres. Sells Iranian madder. P&M Woolcraft unfailingly friendly and efficient with good prices (but Pauline has very sadly just passed away, so Martin may not be able to fulfil orders with the usual turnaround). Poyntzfield Herbs – a great little company from the Black Isle in NE Scotland. Sells dyers woodruff and sweet woodruff plants. Their website is a bit low tech but they respond promptly to emails and are very helpful. Our plants arrived safe and sound when we put in an order earlier this year and are doing well. Emorsgate – specialists in wild flower seeds – you can order in bulk for sowing whole meadows! We sourced our ladies bedstraw seed from here. Saith Ffynnon – another good small supplier for wild flower and other useful plants. Sell seed and plants. Stock varies according to season. This entry was posted in Follow up to Cambs Guild Talk April 18, Talks on dyeing and tagged Cambridgeshire Guild of Weavers Spinners and Dyers, Madder recipes, Recommended books on plant dyeing, Suppliers of madder and related plants on 30th April 2018 by susan dye.